After being lulled into a false sense of security in late March, more typical Pembrokeshire spring weather resumed today with a cold, strong north westerly, sunshine and hail showers. All in time for the new visitor season! Following successful rat eradication 20 years ago, Ramsey has seen a remarkable increase in its Manx shearwater population and the return of storm petrels to breed. But despite all manner of attempts to lure them back, one target species has alluded us….the puffin! After a winter of 'to-ing and fro-ing' staff and dog made permanent landfall on the island on 8th March when a brief break in an unsettled spell of weather meant a mad dash to launch the boat and go for it! Think of gin and you might think tonic. But now think gorse, heather, thyme and mint and you might be thinking of Ramsey! Weigh in day for the national bird of Wales! Grassholm - Gannets, flies, gannets, dust! 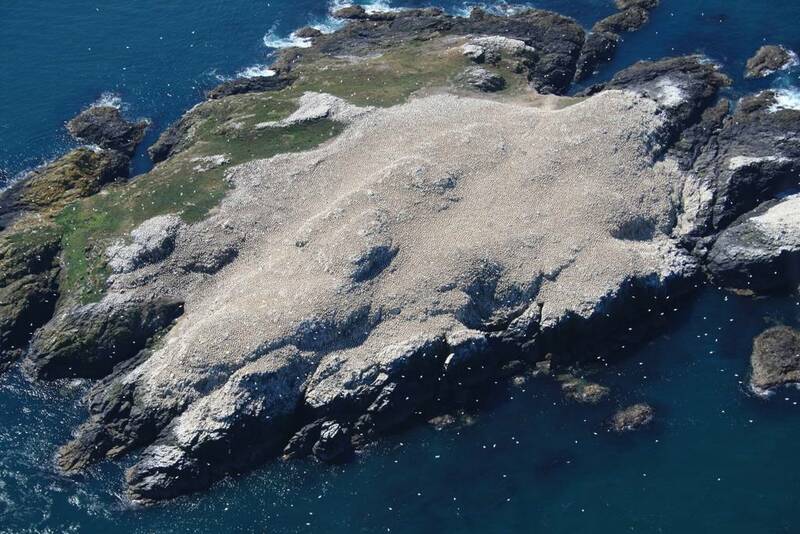 As we reach July and the majority of viable gannet eggs have hatched on Grassholm, the fieldwork season for RSPB wardens and our research partners can begin. We’ve already completed seabird counts from the boat back in May and early June but we never land to work on the island until chicks are a few weeks old and the risk of disturbing incubating adults has passed. Due to a planning decision by the Pembrokeshire Coast National Park Authority the car park at St Justinians has been closed. At present there is an hourly Park and Ride service from St Davids to St Justinians, provided by Pembrokeshire County Council. This will increase to two buses an hour in peak season. As i type this on the afternoon of March 18th it is snowing outside...again. I should be talking about the first chough nest building activity, the arrival of migrants and promising signs of spring. I can touch on some of those topics but March 2018 has been far from a 'typical month' weather wise. We are back on Ramsey for the new season after a short winter break. The island is very wet but everything is in good order. I was going through some paperwork on my return and found a blog which our 2016 and 2017 intern Sarah had written about last year's Manx shearwater season.....and I had clearly forgotten to publish!! It's probably fair to say the last few blog posts on here have been a bit short on 'light entertainment'! And following Storm Brian, hot on the heels of Ophelia, it looked like more tidings of woe were on the way. Yet more grey seal pups were lost and the numbers left on our beaches plummeted still further BUT....there is a good news story to end on! Lying 7 miles off the Pembrokeshire coast Grassholm Island is the oldest RSPB reserve in Wales. When purchased in 1948 it was home to around 7,000 pairs of northern gannet, today that number has increased to 36,000 making it the 3rd largest colony in the UK (behind Bass Rock and St Kilda) and the only gannetry in Wales. Ex-hurricane Ophelia rumbled up the Irish Sea on 16th October leaving a trail of wildlife destruction in her wake. A good friend of mine once told me at the start of my career 'death and destruction is all around you on seabird islands - get used to it!' - and so it has proved. Yesterday, however, it wasn't our seabirds that were suffering, it was our grey seal pups. As the season for residential volunteering on Ramsey comes to a close, we’re already thinking about plans for next year. 2018 will be special for the island as it will be 25 years since RSPB took ownership and opened it to the public. 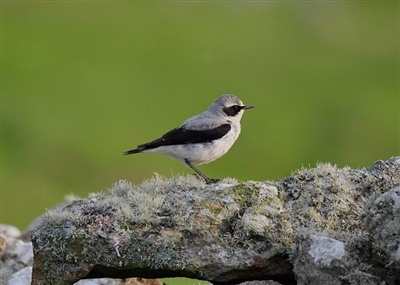 It's been a tough year for a lot of wildlife on Ramsey thanks to the largely unsettled weather, in particular our swallows and house martins. All was looking rosy for them following a dry and settled spring but following the wettest June on record for the island all that changed. The Pembrokeshire fire service arrived on Ramsey just after 9:30 this morning following reports of smoke rising from the island’s Grade II listed farmhouse. Firemen were rushed to the island on the St Davids all-weather lifeboat ‘Norah Wortley’. Using water pumped from the old mill pond, firemen were able to avert disaster, saving the old stone buildings before they were razed to the ground. Our Ravens are sitting on eggs and with the garden blackbirds attempting to build a nest to rival that of their somewhat larger cousins, spring must be here. 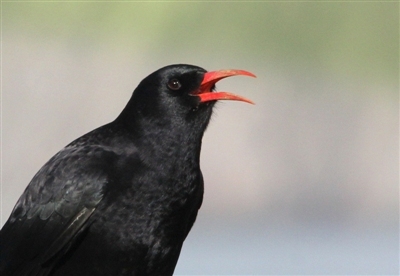 Despite the cold, damp weather and a distinct lack of sunshine it is time to start keeping an eye on our chough pairs too. But it’s all change in the Ramsey chough world, with the loss of two of our oldest birds over-winter.